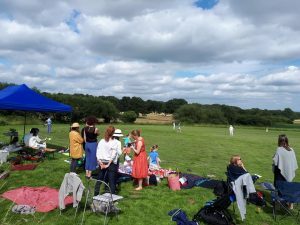 On Saturday, June 23rd , Luxembourg’s National Day, members of the Cambridge and Oxford Societies and their friends gathered for the annual Cricket challenge and family picnic. 40 adults and 22 children were registered. The event started at 13:00 with Pimms and enjoyable conversation. It was a perfect temperature, nice and sunny but with a pleasantly cool breeze and participants old and young enjoyed the very relaxed atmosphere. This year the formula was for participants to bring their own picnic, supervised barbecue facilities were available for those who wanted to grill their own sausages or piece of meat, the Societies providing beer, wine, water and soft drinks. The formula was a success! As far as the cricket was concerned, it was on the one hand a triumph for Cambridge: we had 13 players available, with Peter Welch handling the scorebook on the sidelines so as to rest for Sunday’s half-marathon, and Veronica Welch (Peterhouse) saving herself for the Maidens match the following Wednesday. 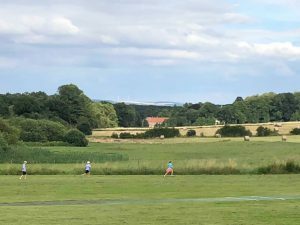 Also, if we aggregate all the innings played we find Cambridge had a huge score: Rory Herbert topscored with 24, Gerhard (Louise Benjamin’s ‘Ironman’) was unbeaten, and who will ever forget Tom Weidig’s first bat on a cricket field? However, in the interest of some sort of even contest, four players from Cambridge were nominated to ‘count’ against the four from Oxford, while all participated in the field. 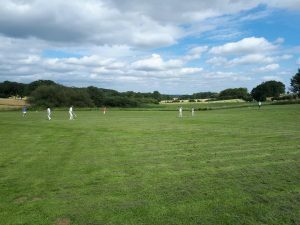 Lydie Wykes-Templeman and Rebecca Welch batted nicely against Phil Wynn-Owen and Oscar Macrae, although there was one run-out leading to runs being deducted. Then Adrian Wykes and Simon Norcross took on James Leader and Angus Macrae. Although runs were scored there was one more wicket so that Cambridge’s total was only 12 off the 4 eight-ball overs. Malvina Welch and Stella Wykes-Templeman then enjoyed a couple of overs batting in the sun against fellow-Cantabrigians (and twins) Rebecca and Lydie. 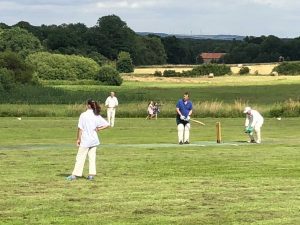 Cambridge had high hopes as Lydie and Rebecca bowled well against Phil and Oscar to restrict them to 7 at the half-way stage, with one wicket taken. But then DOOM arrived as Adrian Wykes, exhausted by preparing the ground and over-budgeted in the barbecue sausage department, waddled in tremulously to deliver, and was carted around the park by the sprightly Leader and Macrae duo, their ten off the over dousing any embers of optimism that might have lain dormant in the Cambridge hearts. Never mind. Malvina bowled an over instead of the wicket-keeping Norcross, and Oxford had 26 in total. The flexibilty and exhibitionism involved in this event mean that it has been a very shrewd move not to have a trophy or any serious record of what has taken place on the field – fundamentally the three games over the last four years have been a celebration of summer and fellowship, and this year’s conversational draw joins those of 2015 (unbelievably hot) and 2016 (unbelievably wet) as a memory to treasure.